The goal of the 4-day program is to provide trainees with an opportunity to learn more about the many careers in the life sciences (biotechnology, biopharma, biofuels, medical devices, government, non profits and academia) for people with science or medical backgrounds. The course provides a high-level overview of the many careers in the life sciences and then explores in detail the basic steps to find employment, so that trainees will be well prepared to find employment after the class. Trainees have an opportunity to have a one-on-one consultation with Toby Freedman, where she will review the results of the personality test and discuss career options. Time will be spent reviewing and improving each trainee's resume, so that their chances of finding employment will be improved. There are many careers in the life sciences industry--with so many options available, how do you identify the career that best matches your interests, skills, values and professional goals? Join us to hear Toby Freedman discuss the findings of her book, Career Opportunities in Biotechnology and Drug Development. 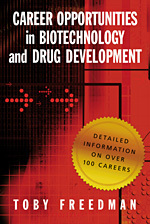 Her book is a comprehensive overview of the many careers in the life sciences and it covers 20 vocational areas and over 100 different careers. Her book is based on interviews with over 200 industry executives. Toby will describe the many career opportunities in industry, government and non-profit organizations. She will also discuss some of the advantages and disadvantages of working in industry so that you can identify and embark on a fulfilling and meaningful career. In addition to helping you identify vocational areas that interests you, Toby will provide her executive recruiting perspective to provide useful tools and resources to give you an advantage over other applicants applying for jobs--this includes networking, resume and interviewing tips to help you find the job that will best match your interests, skills and personality attributes. There is a vast array of career opportunities for scientists in biotechnology, pharma, medical devices, biofuels and healthcare industries, and also in government, non profits and in academia. Toby will speak about the many opportunities in the life sciences, from careers in venture capital, marketing to discovery research and will talk about how to make the transition to industry. The end of the class will discuss job search strategies and networking. High level overview of the many careers in the life sciences industry for biological and food science graduate trainees - careers in industry, academia, government and non-profits will be described. This is a challenging time to find employment in the life sciences industry. Companies are receiving hundreds of resumes from qualified applicants for each job posting. How can you stand out above the rest? In an informal and interactive format, Toby will provide her executive recruiting perspective to offer useful tips resume development and interviewing so that you will be more likely to be noticed and more prepared when applying for jobs. Interviewing tips: what are hiring managers looking for and what are the answers to common interview questions? This is an opportunity to have individual consultations with Toby to address specific career questions that trainees might have. Toby will review the answers to a short self-assessment questionnaire that can help trainees identify a career path that best matches their skills, interests, personality and goals. For more information or to invite Toby to speak, please contact us.